Everyone knows Good Will Hunting; not necessarily a must-see cinema classic, no special effects, ear piercing bullet sounds or loud explosions to practically blow you out of your seat, but it tells a great story. Young Will Hunting, a kid who grew up on the wrong side of the tracks, is torn between hanging out and getting drunk with his south-Boston friends or reaching his potential as a gifted mathematician and all-round genius. His troubled behaviour eventually lands him in jail, however, he is released early on the condition that he sees a psychologist. As with the numerous authoritarian figures he meets, he diminishes the personalities of the psychologists until he meets Sean, a psychologist also from Southie, played by Robin Williams. 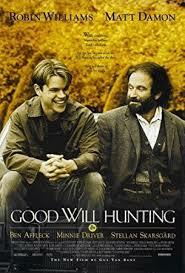 Good Will Hunting is an enjoyable watch from start to finish, definitely worth seeing on the big screen.